I’ve noticed that when people find out I’m a Texan, they assume a few things: I’m mighty friendly, I love biscuits and barbecue, and I know a thing or two about Southern hospitality. And none of those things is wrong. But, I have to admit the hospitality part trips me up sometimes. When faced with unexpected guests, my house is often 80 degrees (I’m happier to live my life without the sound of air conditioner) and there are piles (and I mean piles) of sugar-coated dishes in the sink. No one told me there’d be this many dishes involved in running a food blog. So when I hear someone is coming down my way and wants to pick some produce from the garden, I flip on the AC, start gathering dirty dishes into one enormous pile (as if this is somehow better than scattered piles), and put some hot water on to make a fresh jug of sweet tea. 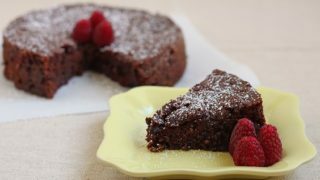 Lately, my visitors and last-minute dinner guests have seen fewer dishes because I’ve been working on this one-bowl easy chocolate cake. Although, one Sunday I had every bowl I owned coated in chocolate cake batter with a wooden spoon and chocolate fingerprint-coated labels denoting ‘version 1′, ‘version 2’, etc. Let’s not even talk about all the sticky jam-coated spoons. 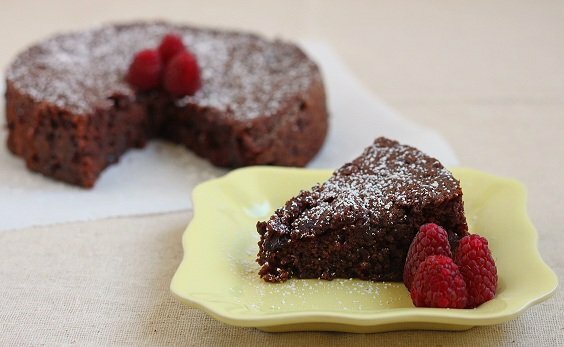 All of this so that you may have an easy go-to recipe for chocolate cake up your sleeve. One final note, this cake is dense and fudgey, not light and birthday-cakey. Like any good (almost) flourless cake, it tends to sink a little in the middle. If this sort of thing bothers you, plop on some freshly whipped cream to fill in the dip. In a medium bowl (large enough to hold all of the batter), melt the butter in the microwave in short pulses. Meanwhile, butter and lightly flour a 6” round cake pan. Once the butter is melted, stir in the chocolate chips. Stir the chocolate constantly until it melts completely into the butter. Next, add the jam and sugar and stir vigorously with a wooden spoon. It’s ok if some of the jam doesn’t melt into the batter. Add the egg and stir in very well. Finally, sprinkle the flour, baking powder and salt over the batter and stir just until well-combined. Pour the batter into the pan and bake 43-46 minutes, until a toothpick inserted comes out with only moist crumbs clinging to it. Let cool completely before attempting to cut or serve. I’d never have thought of using jam in a chocolate cake but I can imagine that it gives a really great texture and flavour and anything that cuts down the amount of washing up I have to do is a bonus. Looks super delicious! I hear you on the dishes, sometimes they are endless! This one-bowl cake looks fantastic, though! I love the way this sounds and very much like a torte. With all the ingredients on hand I’m tempted to whip this up for my daily chocolate fix. Thanks for sharing this recipe. I am terrible with the dishes. They seem to multiple, I swear! So I am a huge fan of anything one pot or on bowl. Especially when it involves chocolate! Great recipe! Thank you for doing the hard, but tasty work in coming up with the right ingredients! I like dense and fudgey, so this would be right on. This cake is beautiful! The addition of jam and the short ingredient list make it even better! YUM! I keep my house warmer (but with the A/C) and my friends know I cook, so they house may not be spotless, but they’re willing to overlook it for what’s cookin’! That is such a beautiful photo and I love that you added jam to this cake! Couldn’t agree with you more on that annoying “A/C” noise — I’m reveling in our less-than-100-degree weather now with the windows open. Thanks for another great recipe, Christina — your hospitality is charming! I am so bookmarking this one. I am not a big fan of jams, what can I substitute that with? some more chocolate or something like that? I’ve said it before and I’ll say it again! I LOVE that you make treats that only serve 2! It’s a brilliant idea and I think sooner or later you’re going to get a cookbook deal. Seriously. This looks like the perfect fix for my chocolate addiction. Of course I can eat your desserts for two by myself! Looks so nice and rich, and I love the combination of chocolate and raspberry. I’m guessing people may think my house is warm too then…well today I HAD to put the air on, it was about 83 in the house and nothing seems to get done quickly when it’s that warm! This recipe is perfection! I am making it for the second time in one week today. My guys loved it and it is so simple! I didn’t have a 6 in. cake pan but just used my 8 in. one and it turned out perfectly… I just did a shorter bake time. Just thought I’d mention it in case someone else is in the same fix. I made this for my daughter’s birthday 1- because she loves chocolate and 2- we didn’t need an entire cake left over during the holidays. I used homemade raspberry pear jam and omitted the sugar and baked it in a pie plate. We can’t wait to eat it tonight! YUM! Thanks so much for writing :) I’m so glad it worked out great! I made this for a valentine treat tonight. It was delicious! A go to easy dessert. Thanks! This cake was seriously amazing! I’m always a big fan of your recipes, and this one didn’t disappoint. My husband has been sick in bed for the past few days, so I only wanted to make a little cake for my dessert since he wouldn’t be eating any. This cake was the perfect size, and the flavour is fantastic. I think I’m going to double the recipe next time and bake it in an 8″ pan to bring to work and share with my colleagues. Just made this cake today. Waiting to decorate it and eat it tomorrow! Making a cookies and cream whipped cream frosting to go with it. Was super easy to make and baked completely flat! Easy frosting! Baked in a 6″ pan and only took about half the time for me at 325. Might have been the pan I used that reduced the time. Thanks for this mini cake recipe!! This cake is awesome! Super easy to make and easy to clean up! Making this the second time in the past month,tonight. Thanks for this recipe! Fudgey goodness!! Great recipe! Baked it in a 6″ springform pan, the middle fell but it was fine- more room for the ganache I put on top! Love the sound of this cake. Sounds delicious and easy. I rarely comment on recipes but wanted to say thanks for this one. I’ve made it a few times now and it’s always been a great last minute cake that tastes special. I’ve tried several types of jam, tonight was cherry. Love the portion size and how easy it is. Thanks! p.s.- followed the recipe exactly except added chocolate ganache frosting since I had more chocolate and some whole milk on hand. So so so delicious. I can’t stop my self from eating it. The idea of using the jam is really fantastic. Yammy ??? ?